If you believe the ads, Slim Shots could be your best shot at shedding unwanted weight. Slim Shots are packaged in containers that resemble miniature coffee creamers and are showcased in a kicky ad that claims you can lose weight without feeling hungry. But does it really work? 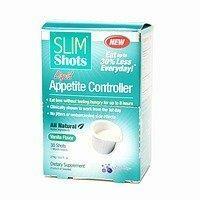 Slim Shots is touted as the latest and greatest liquid appetite controller on the market. Manufacturers maintain that the product reduces hunger for up to eight hours, using only natural ingredients. Slim Shots also contains artificial vanilla flavor, which negates the company's claim that the product is "all-natural." However, the two main ingredients in the popular weight loss product are natural. Palm oil is considered by health experts as a solid fat, while oat oil is a powerful emollient that is often used to hydrate dry skin. Oat oil is also rich in antioxidants and Vitamin E.
The company recommends that users take two shots a day during the first week and once a day (preferably with breakfast) thereafter. Slim Shots can be mixed with your favorite food or beverage or consumed alone. Each shot contains 20 calories, which is roughly the same amount of calories found in two sticks of gum. The product is supposed to start working within two hours of consumption. According to the manufacturer, Slim Shots helps trigger the body's natural appetite control mechanism, known as the ileal brake. The product is designed to delay hunger signals and allow a person to go about his day without feeling deprived of food. Basically, the company claims that the miniscule amount of fiber from the oat oil and the good fats from the palm oil will make you feel full, and thus result in reduced intake of food at each meal as well as the number of meals you eat per day. The company also offers a number of disclaimers about the product, including the fact that in order for Slim Shots to be effective users must consume a reduced calorie diet and workout three times a week for 30 to 45 minutes. The manufacturer also advises that users join a fitness class or devise a home workout routine that incorporates both aerobic and strength training exercises. Doctors warn that one of the ingredients contained in Slim Shots, phenylalanine (50 percent of aspartame), can have dangerous effects for diabetics and those with Attention-Deficit Disorder (ADD)/Attention-Deficit Hyperactivity Disorder (ADHD). In addition, those suffering with the autosomal recessive genetic disorder, Phenylketonuria (PKU), should avoid taking the product, as medical experts say it can cause brain damage or even death. Also, if you are pregnant or breast feeding, you should consult with your doctor before consuming the weight loss shots. The Food and Drug Administration (FDA) has yet to approve Slim Shots; however it should be noted that currently there is only one over the counter weight loss supplement on the market that has received approval from the FDA-Alli. Will the appetite suppressor pose a risk for increased cholesterol? Will it increase the risk for intestinal problems? Will it increase gas and bloating? What impact will long-term use have on a person's body? Slim Shots is widely available online and at various drug stores. A one-month supply costs about $40 plus tax. Each box contains 30 shots. The company claims that most individuals find success taking one shot per day; however, if you feel you need to take two shots per day to facilitate weight loss, your cost will double per month. The liquid weight loss supplement is convenient and features very few side effects, but it is by no means a cure all. In addition, the manufacturer stresses that the product will not work unless combined with a healthy lifestyle that includes regular exercise and a balanced low-calorie diet.